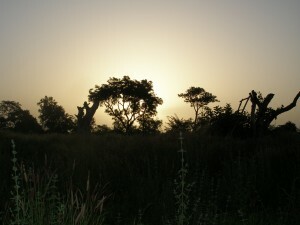 My most recent African adventure was a week long trip to the Kedougou area. After a two day journey in a bus, we made it to our destination of Kedougou. 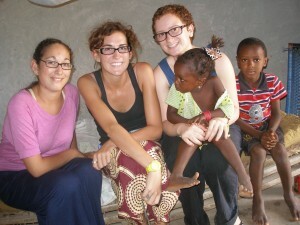 Kedougou is the region in the lower right corner of Senegal, bordered by Guniea.Each of us students were hosted by a family in a small village of an ethnic minority. I was in a village of the Peul Fouta. Peul is the ethnic minority group, and Fouta refers to the location of the village and their origins in the Fouta region of Senegal. The village was only 2 or 3 kilometers from Kedougou, which meant that the villagers had more access to supplies from the city (when I say city, I mean town, but by Seneglese standards it is a city). I was staying with the village chief’s first wife’s family compound along with Kathleen (a fellow American), while Kayla (another American) was in the family but in another compound across the road. Once we left the hotel, Kayla, Kathleen and I rode a four-wheeler to our village, where we were going to stay for the next three days. My brother Kindi and I spent the afternoon and the evening together, as Kathleen would not be joining us until the next day. He showed me around the compound, introduced me to various members of the family and settled down to some ataya and a nice chat. We had to move indoors because it suddenly started to rain. Over the course of the rest of that first day I discovered his background and story, which was very intriguing. He is twenty six years old, and for several years he was in the army, stationed in Casamance to suppress the rebels. It sounds like he was involved in a lot of direct combat (he told me specifically that there were days where he thought that he would die in combat), however I have heard that the rebellion is not as strong as it once was. He is very interested in learning English as he wants to move to the US some day. He has notes that he saved from previous SIT students, and studies them in order to prepare for when he goes. I asked him if he ever wants to go to France and his response was that they are too racist. Interestingly enough I was reading “Docker Noir” at the time, and he had also read that book. I believe his point of view could be biast based on what he has read, which was probably written by Senegalese authors, and what he has seen of French tourists. His idea is that he wants to go to the U.S, get any sort of job he can, even join the army, and make money for his family. He is absolutely convinced that if he goes to the U.S. he will learn English in two months, have a job and a place to live and have a better life. Throughout the trip I had a hard time explaning to him that it was not all that easy to just go to the U.S. and be successful like that. In fact, it was a struggle for me the entire time to convince him that life in the U.S. was not as easy as the movies make it seem. Later on, just before dinner, he wanted me to get out my notebook and start to learn some Peul. The lesson was very short and simple and after that he did not push Peul on me, as he knew I was only there for three days and therefore wouldn’t be able to speak it that well. Afterwards we just relaxed, he made some more ataya and we continued to chat about this and that until I decided to go to sleep. The first full day was very relaxing, although I discovered that everyone wakes up much earlier in a village then in a city. I was woken up by the sounds of animals and by 7:30 the noise was almost too much for me to sleep anymore. For breakfast we ate this porridge style food that was hot rice and lait caille with a “little” bit of sugar (a Senegalese little, which means a lot by American standards). This was about the most delicious and filling breakfast I had had yet in Senegal, and I was very satisfied. Kathleen showed up as we were making Ataya and I was happy to see that she was feeling better. Kindi explained the family situation to her as he made tea, and after the whole process (which does take quite a while) we went over to visit Kayla. Almost as soon as I sat down with her, all of the young girls that lived in her compound came up and began to braid my hair. The girl that was in charge of Kayala, Khayka, was an eleven year old fireball. She was the ring leader of everyone around her, and she told us what to do and how to do it. As we were leaving Kayla’s compound, with our village girls in tow, we were stopped by one of our many brothers. He tried to explain to us that his son had a gash in the roof of his mouth, and they couldn’t afford to send him to the hospital, and wanted to know if we had anything for it. All of us were shocked that this was something that he felt comfortable asking us and that he genuinely believed we could help. This encounter shock me a little bit. I felt that I should be able to help them, as I felt awful for just being an observer when I know that something can be done to help this boy. However, once I walked away I realized that my role here is as an obersver, I am here to learn and give them the gift of the value of an education. As tough as it is to simply observe, that was our task. The rest of the day passed fairly slowly, as Kathleen and I discovered, village life moves very slowly. The only real markers in the day were the meal times, interjected with ataya preparation. 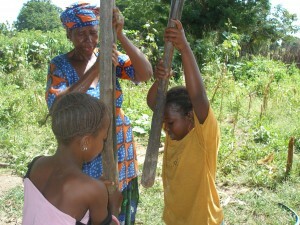 The women prepared all of the meals, did the laundry and cleaned the compound. The young girls would also help out with the meals and or any other random chores, although most of them were free to run as they pleased. The boys would run around, play games or soccer, or watch the men make tea and talk. There was a school in the middle of the village, however it was not in session because the school year starts after Tabaski for them. The men, if they did not work (which all the men except one worked in my compound) would sit around and make tea, visit other men in the village and have long conversations with each other. I did enjoy watching these conversations, and occasionally I participated in them if the visiting male spoke French enough to include me. It was very pleasant to be invited in their conversation, especially since it was generally something that was semi controversial. I did notice that during these conversations there was a general trend that if the eldest man stated his opinion, he would never be formally contradicted and he would also have the final word on the conversation. The roles of the different genders were very obvious to me in the village because the men never entered into the female sphere and their lives intersected as very specific moments (meal times) and rarely at other times. One of our adventures of the village stay was a trip down to see the Gambia river, which is right on the edge of the village. The first time we went it was just Kathleen, myself and our brother Bala. He showed us where the hippos normally live (we did not see any unfortunately), and the dangers of the hippos. I didn’t know this before, but the baby hippos live on land once they are born and the mother hippos will bring them food. The month that that normally takes place is December so Bala told us that during that month it was very dangerous to go to the river. The second trip to the river we went with Kayla, Kindi and Khayka, but again we did not see any hippos. This time it was more of a photo shoot as we took many photos by a big tree where they collect honey. Eventually we had to stop walking along the river because we were getting close to where anacondas live. The trip to the river really brought it home to me that in a village you literally live off of the land. The food grows right there, it is harvested by the villagers and then prepared by them for meals. Although the family didn’t have very much money, there was never any shortage of food. To me it demonstrated the reality of how you do not need money to be happy and satisfied. Family was so very important to everyone there, and not once did I see someone do something completely alone. The support of the family kept everyone in good spirits, no matter what. To me it was quite a realization to see this in action as for me it was one of the things that I will take with me from this experience. Towards the end of our stay, Kayla, Kathleen and I decided to give them a gift of American culture. Khayka and the other village girls were incredibly interested in learning American dances, but they only wanted to learn dances that went with songs. All of their dances, such as the Youssa, always went with a specific song. We would all stand in a circle and clap and sing the song. Each person in the circle would get a chance to do the dance that Khayka had decided we were doing. After a while we braved the circle and taught them “Teach me How to Dougie”, “Stanky Leg”, “ Hokey Pokey” and finally “ The Macarana”. All of the children and the women who were watching laughed at us silly Americans. However, I think they really loved the effort that we put in, and in the end we all had a blast! It was such a great cultural exchange between the villagers and the Americans. For us it was a great way to find common ground and show them that despite our cultural backgrounds we can still make connections. From this experience I took away more then I can say in words. I learned a completely different way of life and a different way to look at the world. Their village was not as poor as others that people visited, but I still feel like I saw glimpses of how hard village life is in comparison to city life. I have so much respect and admiration for the villagers who I lived with, especially the women. The women worked tirelessly everyday to keep their family healthy and happy, and they certainly received no credit. I never felt uncomfortable with my family and their way of life, but the only thing that made me slightly upset was how little credit the women got. Overall, I am so thankful that I got this experience, I only wish it could’ve lasted longer.